Golden Son is the second book in Pierce Brown’s Red Rising series. The first book, Red Rising, really took me by surprise (in a good way) and I have the most recent book in my ARC queue so I thought I’d better get caught up with the series. Darrow grew up as a ‘Red’ – a worker class citizen in a caste-based civilization. The upper class – the Golds – led the Reds to believe that they were working to create a better future for everyone, but the discovery that the entire system was designed only to make the Golds’ lives easier. The Reds revolted and many were killed during the uprising. Darrow managed to escape and secretly build a new life for himself. Now Darrow is the favored son of the ArchGovernor’s family and he continues to build friends and followers and power among the Golds (who have no idea of his Red past). But of course he has also developed his share of enemies who aren’t happy with this new-comers rise. But Darrow was raised as a Red and he is ill-prepared for the political back-stabbing and conspiracy that her now faces. Darrow will need to think quickly and keep an eye on his back while he moves forward with hopes to bring down the whole rotten caste. Like its predecessor, this book is constant action around a carefully plotted story. Too often we find a second book that tries to recreate the magic of a first book only to rehash plot and action. It’s refreshing then to have this book stay in the same world but have such a different feel about it. Darrow’s experiences here are quite different from how we saw him earlier. But his heart is the same and he doesn’t just go on a quick Gold-killing spree but he tries to get to understand the people he’s around, hoping to get them to make changes that will benefit all classes of people. But he’s not afraid to take action – and he’s now well-trained! This is a fun book and an exciting series so far. I look forward to getting deeper into the series. Looking for a good book? 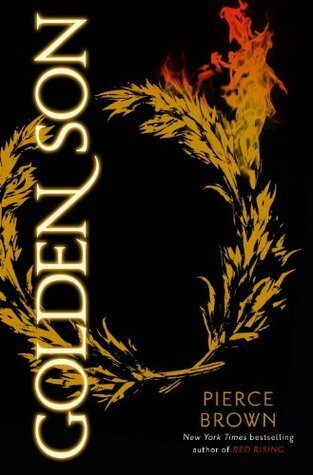 As the second book in the series, Golden Son by Pierce Brown keeps up the excitement and suspense in the Red Rising Saga.